With more than a wink, the poised Laura Benanti portrays herself as a child show tune nerd recounting highlights from her stellar career with comedic flair. 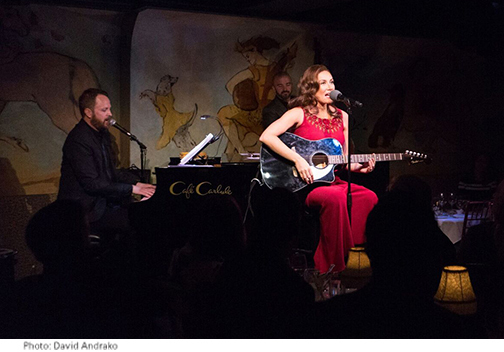 You could say this Tony Award winner's show at the Café Carlyle, Tales from Soprano Isle, glimpses her life backwards: songs from her recent hit musical, She Loves Me, to her very first Broadway role as Maria in The Sound of Music. And after introducing her accompanists, music director Todd Almond and bass player, Brian Ellingson, including the "drummer girl" she is carrying--yes, she was big with child under her red sheath (in case you didn't notice), Benanti pays homage to her music teacher mom, to Harry Chapin, Joni Mitchell, and Tori Amos, with ample anecdotes, including a wild night of double vodkas with Patti Lupone. And there's more: a tumble from a swing in Women on the Verge of a Nervous Breakdown and a cracked pelvis, not to mention a funny bit about the two men she married before Patrick Brown last November. But these stories are merely prompts for her music, and it is simply sublime. Nobody in her New Jersey school knew who Rosemary Clooney was, so she sings "Our Love is Here to Stay" and "Love, You Didn't Do Right By Me," mashed up, accompanied by Todd Almond, and adds his lovely composition "Take Good Care of Me." Most touching of all, a nod to impending motherhood, for her finale, she put down the mic to sing a song her mother sang for her, Kander and Ebb's "Quiet Thing."